The global economy thrives in a business world that's always on. A web presence is imperative for any enterprise in the current business environment. OpenAccess will assist you to effectively implement a web presence whatever the size of your enterprise. We have Web Hosting packages suitable for individuals and small business. Our Dedicated Server gives your company the use of our equipment providing the bandwidth and power of a dedicated server for anything from e-commerce services to enterprise-wide hosting. If you need something in between basic WebHosting and a fully dedicated server, our Virtual Server product line provides you with all the benefits (including 'root access') of a dedicated server without the costs and maintenance associated with running your own hardware. 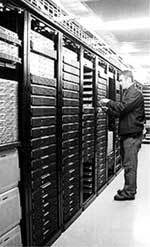 Need secure space for your server equipment? Then OpenAccess Colocation is the answer. Offsite Data Storage ensures the security of mission-critical data with multiple data backup locations.